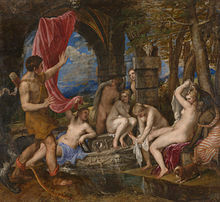 Diana and Actaeon by Titian. The title gives the subject from Greek mythology, but the themes are more complex. In art, theme is usually about life, society or human nature, but can be any other subject. Themes are the fundamental and often universal ideas explored in a work. Themes are usually implied rather than explicitly stated. Deep thematic content is not required in a work, but the great majority of works have some kind of thematic content, not always intended by the author. Analysis of changes (or implied change) in dynamic characteristics of the work can provide insight into a particular theme. A theme is not the same as the subject of a work. For example, the subject of Star Wars is "the battle for control of the galaxy between the Galactic Empire and the Rebel Alliance". The themes explored in the films might be "moral ambiguity" or "the conflict between technology and nature". Themes differ from motifs in the visual arts in that themes are ideas conveyed by the visual experience as a whole, while motifs are elements of the content. In the same way, a literary story with repeated symbolism related to chess does not make the story's theme the similarity of life to chess. Themes arise from the interplay of the plot, the characters, and the attitude the author takes to them, and the same story can be given very different themes in the hands of different authors.